Model saw her subjects as misshapen, almost beastly. 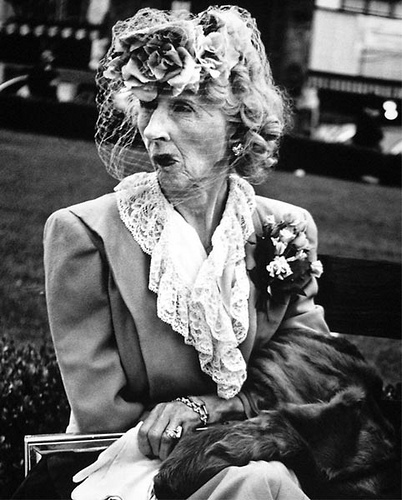 Another refugee who had to stoop to hustling, scrambling, and scraping by, and ultimately to street photography to support herself, was Lisette Model. Although she came from Vienna, Model had a background similar to Gutmann’s, which gave her a Berliner’s perspective on life. She too had come from a wealthy family and studied painting before taking up photography. She had been exposed to avant garde art and unconventional ideas from the time she was a child, when her favorite playmate was the daughter of composer (and future emigre to Hollywood) Arnold Schoenberg. Like Gutmann, Model turned to photography at the suggestion of a friend who pointed out that with the rise of Hitler, it might be useful to have an itinerant profession. Since she was living then in Paris with her Russian Jewish husband, this seemed to Model a good idea. With some instruction from Kertesz’s wife, Elizabeth, she set out for the south of France to try her hand at street photography. From the very beginning she sought out subjects who would suggest the corruptness of society. 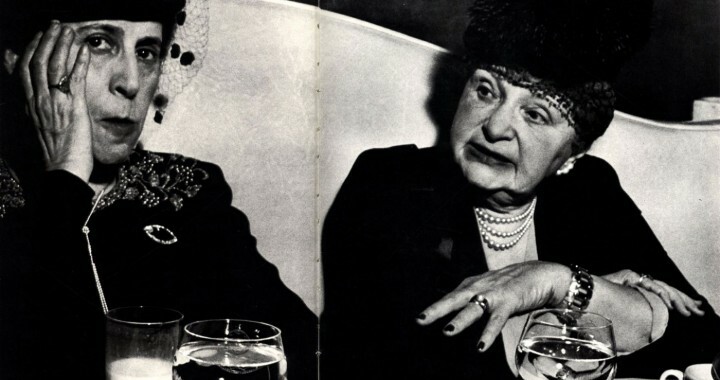 Pictures from the test rolls she shot along the Promenade des Anglais in Nice could easily be taken for caricatures George Grosz had drawn of cabaret goers on the Kurfurstendamm. Like Grosz, Model saw her subjects as misshapen, almost beastly. A wealthy dowager is photographed at a moment when her face has exactly the same expression as her lapdog’s. A gambler sunning himself in a chair watches Model with a lizard eye and hands curled like the talons of a pet bird of prey gripping its perch. Model worked often in the late afternoon, thus giving us the impression that darkness is about to descend on the world in which these people live. When she got back to Paris, she continued her project by making pictures of the poor that complemented those she had done of the rich. She again photographed the obese and the grotesque. Petite and refined though Model was, her photographs are as aggressive as an assault with a blunt instrument. Petite and refined though Model was, her photographs are as aggressive as an assault with a blunt instrument. Nearly all are the most direct of street portraits, head on confrontations with unattractive subjects. They have a brutal look whose relentless consistency from one picture to the next implies a universal brutishness inherent in man himself. It’s a look Model emphasized by always insisting on big (16 x 20″), rough prints. And in America she continued to see the world in the same terms, photographing both derelicts and society matrons, so that they reflected each other’s grossness. She found in American vulgarity the perfect counterpoint to the European decadence she had left behind. The only change that seems to have come over her photography was in the direction of a greater Expressionism, making her images still more like Gutmann’s and Grosz’s. Model began photographing reflections of the street in shop windows in a way that makes New York look like the town in which Dr. Caligari lived. She also started a series in which she lowered the camera to the level of the sidewalk to catch the blurry tangle of passing feet. This imagery is straight out of the bad dreams of a refugee from Nazism. The pictures have an oppressive, claustrophobic feeling, as if made by somebody who had lost her footing in a panic in the streets and was being trampled by the crowd. Some of Model’s other pictures from the 1940s, in which she aimed up at passersby at close range, are a variation on the same theme. In one, a banker in a bowler walks under the statue of George Washington on Wall Street. The statue extends its hand in what looks like a gesture meant to keep someone on his knees from rising. A massive, grisly figure, so close that he is out of focus, the banker has a shadow like a bandit’s mask concealing his eyes. He bears down on Model as if about to run her over. She appears to be literally beneath his notice. YOU MIGHT ALSO LIKE: HenryK: "My Kind of Town"
Like Gutmann, Model had a long career as a teacher but a relatively short one as a working photographer. Although she got a steady stream of assignments from Harper’s Bazaar for a while, those ended by 1951, and virtually all the photographs for which she is known were taken in the thirties and forties. In fact, her entire American reputation was built on those few test rolls shot on the Riviera. That she was praised effusively for such a meager body of work only made her initial success in America seem to her as specious and potentially transient as life had proven to be in Europe. She mistrusted the fact that the Americans were, as she put it, “making [a] beginner into a star, putting me on a pedestal for something I didn’t even know … I was doing.”‘ Her rough, over-enlarged prints were admired in the same fashion, for an artistry to which they did not pretend. When Edward Weston wanted to know how she achieved the effect they had, she told him that she took her film to the corner drugstore to be processed. The sarcastic answer, the grainy prints, the ugly subject matter, and the crude negatives that were often motion blurred or out of focus were all of a piece. So was the imagery. Like those of Grosz or Gutmann, her pictures match a disregard for art with a disrespect for the world as she saw it. 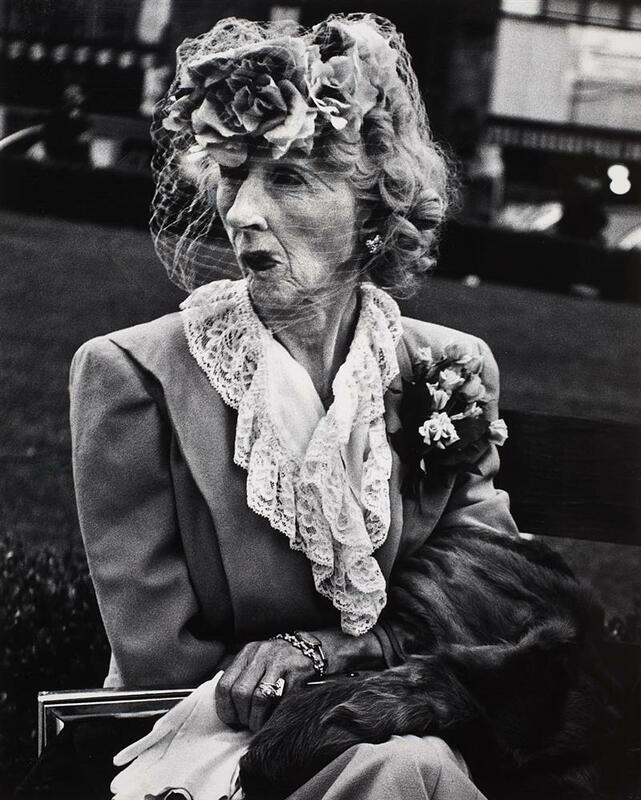 Posted in Essays, Highlights, Street Photography and tagged Essay L, Lisette Model, Portrait, Street Photography, The New York School.